The scammers stay one step ahead of the platform, which isn't great news for the midterms. Sure, Elon Musk tweets a lot. Probably more than he should (at least without a lawyer present). But have you noticed just how many Elon Musks there are on Twitter? A lot. The controversial billionaire has been the target of countless scams and schemes that often use bots to rope not-so-diligent users into believing it’s him. Fake Elon Musks have been roaming Twitter for years now, some of them with handles that only slightly deviate from the real thing by a letter (like @elonmsuk), while others don’t try nearly as hard (they use Elon’s photo and user name, but with a completely different handle). Twitter users are reeled in — a tiny “donation” (usually an infinitesimally small amount in an obscure cryptocurrency) that will get me a huge payout in return? Yes, please. That “donation” comes with sensitive information like credentials for cryptocurrency wallets. The “giveaway” they get in return for that donation will often include coin mining malware that installs itself on the victim’s computer. In some instances, hackers are able to steal cryptocurrencies from the victim’s wallets outright. The scheme is so common, it’s even caught the attention of the real Elon himself. Twitter decided to crack down on these scammers. Back in July, it started locking any accounts that used the display name “Elon Musk.” But the scammers are staying one step ahead of Twitter. Every day, they are finding new ways to stay ahead of the curve, sometimes with amusing results. 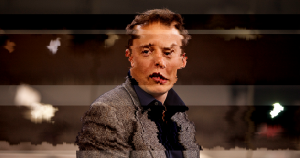 The scammers’ latest ruse involves altering the Elon Musk avatar in bizarre (and hilarious) ways to circumvent Twitter’s algorithms, as Twitter user @vogon points out. Granted, we don’t actually know if Twitter is using algorithms like this to scan for duplicates and fake accounts. The scammers are likely trying to come out ahead, and preempt Twitter’s future actions. It also wouldn’t be in Twitter’s best interest to announce its actions to the world if it is scanning avatars for fake accounts. Facebook tried something similar in December last year, catching fake accounts using facial recognition. Things didn’t go all that well — users accused the platform of using personal facial data without consent, and eventually Facebook admitted this technique was completely ineffective. For now, it seems, the scammers are still kicking around. To find some, just (carefully) go through any replies to the real Elon Musk’s recent tweets. Dissatisfied with Twitter’s ineffective ways to ban the scammers, Musk took matters into his own hands. As Coin Telegraph reports, he even asked Dogecoin creator Jackson Palmer to “help get rid of the annoying scam spammers.” Notably absent of this conversation: Twitter itself. In truth, Ethereum scammers are small fish for Twitter, but it doesn’t seem to be able to get rid of them. How can a platform of a third of a billion users be trusted to delete misleading information if it can’t even address that? This doesn’t bode well for the impending midterm elections. Once equipped with targeted misinformation and countless fake Twitter accounts, foreign forces such as the Russian Internet Research Agency will likely have an incredibly easy time spreading politically charged “fake news” on Twitter.